With Empire State South, Hugh Acheson explores his singular take on Southern food. 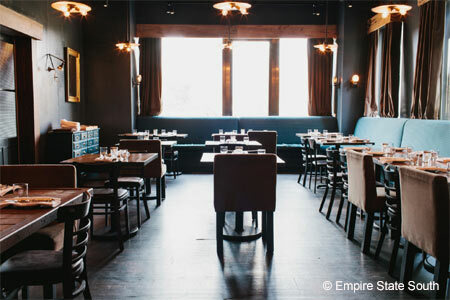 : From the hand of Canada native Hugh Acheson, Empire State South is part coffee bar, breakfast restaurant, to-go spot, and full-fledged dining room with a serious wine perspective. Breakfast begins with Georgia-produced yogurt, local eggs with grits (stone-ground, of course), and biscuits. House-made pimento cheese rules. And the Counter Culture Coffee, from Durham, North Carolina, is perhaps one of the best cups we've ever had anywhere, with notable depth of flavor. At lunch, savor a po' boy sandwich of oysters with rémoulade sauce or smoked quail. For dinner, try the "In Jars" offering of five small items from the "Snackies for the Table" section. Indeed, the portion is plenty for two as a warm-up. We suggest the trout mousse and pork rillettes. (The boiled peanut hummus now is made with North Carolina red cowpeas --- an interesting change, but we like the original.) Then sample a pork tasting or go for the Georgia catfish or the pork loin from local producer Riverview Farms. Chocolate-enrobed peanut butter bonbons are among desserts, or opt for a plate of fine cheeses. The wine list is flush with French selections with values in many areas, including grower Champagne. Some Italian, Spanish, South American and U.S. wines are included, and there's a section of Riesling from a variety of producing regions.